As a location, Neubau is quite young and arty. Stroll around and you’ll easily come across a nice local restaurant or bar (and a supermarket and biomarket right across the street). But perhaps best of all, the Innere Stadt is within walking distance. 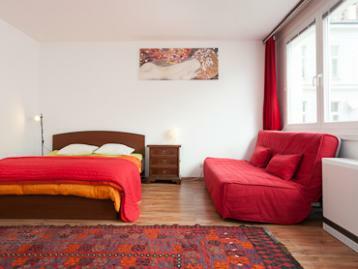 And after a long day’s sightseeing, you’ll enjoy coming back to this nice interior with soothing timber floors, all-white walls and colourful artwork.